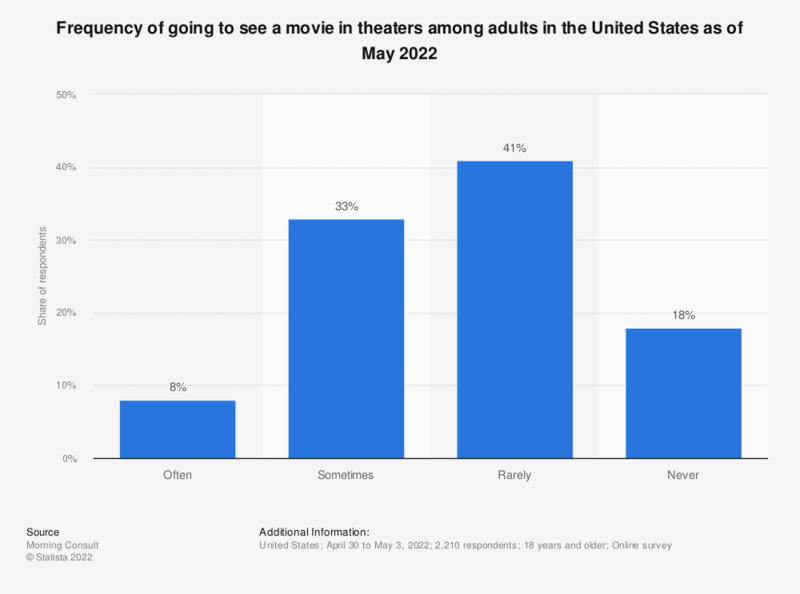 During a survey in early 2019, it was found that just 13 percent of U.S. adults saw two movies in a theater each month on average, whilst 32 percent said that they only saw one. However, the majority stated that they did not go to a movie theater at all. Why don’t more people visit movie theaters? The reticence to go to cinema to watch a movie could have to do with rising ticket prices in North American movie theaters. Back in 2001, the average ticket price was 5.66 U.S. dollars. Five years later in 2006, this price had risen to 6.55 dollars. In 2018, a visit to the movies cost 9.11 U.S. dollars per ticket on average. This means that the cost of seeing a movie has almost doubled in 17 years. Admittedly the increase in price has been gradual, growing by roughly 10 to 50 cents each year, which doesn’t sound like much. However, for a family of four in 2018 the cost of a trip to the movies could amount to over 35 dollars, and that’s without any trimmings like popcorn, soda or snacks, which moviegoers say they like to buy. Is streaming affecting movie theater attendance? It has been noted that the growth of entertainment options offered by streaming services could have an effect on whether or not people are willing to leave their homes to visit a movie theater. Why leave the house and pay around nine dollars per ticket when you already pay for a streaming subscription and can choose from hundreds of different movies from the comfort of your own couch? The sheer amount of options on platforms like Netflix make it all too easy for film lovers to decide against going out and to spend their dollars on subscription upgrades instead of cinema tickets. It’s hard to ignore that times are changing and that movie theater attendance may never be what it once was. But, as long as streaming services continue to offer an abundance of films within different genres from all across the world, the movie fans out there will still have a way to engage with film in the way they choose.